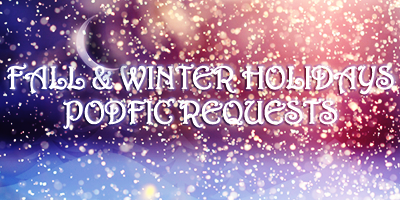 Come join us here at podfic_request to request and create Fall & Winter Holiday-themed podfics! If you're someone who listens to podfic and have ever though "wow, I really wish someone would podfic story X" of if you're a podficcer whose ever wondered what project you should take on next, podfic_request can help. They have themed requests (like this Fall & Winder Holiday theme) but they also have a general request post too. If you were one of the people that saw this comm when it first came out and were scared away by some of the rules/policies, I'd suggest giving the comm a second look. The mods of the comm have proven themselves more than will to listen to the concerns of their members (or potential members) and have changed a lot of the rules of the comm to make it more comfortable for participants.